Beautiful Lake Tahoe Condo near Lake & Skiing: One of the best in Incline. This large end-unit condo is beautifully furnished, recently renovated, and gets lots of sunshine. Conveniently located very close to Lake Tahoe, it's nestled in the trees near the protected and undeveloped part of the lake. The condo is also close to skiing (both Alpine and cross-country, 3 minutes to Diamond Peak), the Hyatt Hotel/Casino, a large tennis facility, two golf courses, mountain biking, hiking and all lake activities (boating, fishing, swimming). There is also a large indoor recreation facility close by with an Olympic-size swimming pool, basketball court, and a fully-equipped gym. This is the owner's second home and mountain retreat. 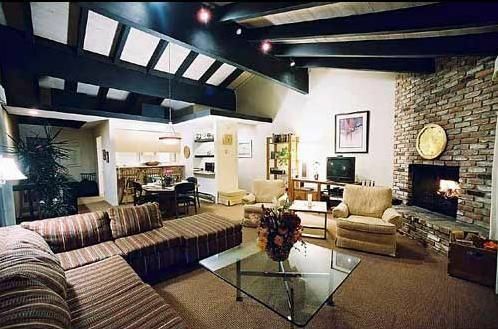 It includes a spacious combined living/dining room with cathedral ceiling, fireplace, and wet bar. There is a fully-equipped kitchen, a desk/workstation, wireless throughout the home, and all the amenities you'll need to make your vacation comfortable. There's also a large 333 square foot wrap-around deck with a propane barbecue grill for outdoor cooking and comfortable deck furniture. It has a great stereo system with a good selection of CDs and bluetooth compatible. Rent directly from owner. Golf courses: There are two excellent golf courses in Incline, and discounts are possible with passes. Tennis Courts: There is a tennis complex in Incline with 10 courts. Daily and weekly memberships are available. Also, the tennis facility can find partners at your level for you. Ski Areas: We are 3 minutes away from Diamond Peak Ski Area (there is also a bus to get there), 10 minutes to Mount Rose, and 15 minutes to Northstar. Also, buses run from the Hyatt to other major ski areas (Alpine, Squaw Valley, etc.). Heavenly Valley is 30 minute drive south. My wife Astrid and I live in Sausalito, California, just across the Golden Gate Bridge from San Francisco. We both grew up on the East coast: New York for me, Connecticut for Astrid. I graduated from Colgate University and Dartmouth College, where I got my MBA. She graduated from Vassar. This is our second home. We love it in both the winter and summer. One of the nicest, largest 3 bedroom condos in the Mountain Shadows complex. Also one that gets plenty of sunlight. It is just as comfortable if you are a party of 2 or up to 7. Although the condo is in a complex, you feel completely separate once you are inside, with a spacious living room/dining room upstairs, with cathedral ceiling. Also, grocery shopping is quite close by, as are good restaurants. Our kitchen is fully equipped, as Astrid loves to cook. Two bathrooms recently upgraded. Hand-held shower head in master and second bathrooms. Digital land line with free calls throughout the 48 states. Thre are at least two sets of sheets for all beds, plenty of towels, hand towels, washcloths, etc. Soap, tissues, and extra supplies like light bulbs are also in the linen closet. Nearby in Recreation center. Very well equipped. There is also a swimming pool, two basketball courts, massage, and other sports facilities, including a tennis complex. Large living room and dining room combined in open floor plan. (3) Flatscreen 37' TV in living room, other TVs in Master and second bedroom. Charter cable with expanded channel choices. Recently upgraded high-quality stereo system with CDs provided, mostly classical but some variety. System is bluetooth-compatible. Various books on book shelf in living room, including mysteries, reference books, a book on gaming (gambling is available closeby at the Hyatt/Lake Tahoe). Variety of board games, Boggle, also several sets of playing cards. Good collection of classical CDs and a few non-classical choices. Very close to Diamond Peak Ski Area. Other resorts (Mt. Rose, Northstar, Heavenly, Homewood, Alpine and Squaw) are driveable). Skis and equipment are available for rent resorts and Village Ski Loft. 2 pools in complex, open in summer months. Incline has two private beaches close by on the Lake which renters can use with a recreation pass which provides discounts. Our stay was excellent. The condo is great, with a lot of space. The bathrooms are brand new and extremely clean. It was very easy to take the free shuttle to Diamond Peak and get to the ski resort in just a few minutes, without having to worry about parking. I would totally recommend this place to friends. It makes us very happy to get reviews like this from HomeAway/VRBO families and hear that our guests enjoy our place. We have furnished it to be very welcoming and comfortable, since it is our second home and we enjoy it too. Each year, we try to make it a bit better by reinvesting in the property so guests will enjoy it even more. We enjoyed having Coerte and would welcome him back again. Comfortable, clean home , full kitchen, very close to Diamond Peaks. Owner is provides excellent information on property, direction, access and parking. Enough beds for everyone. Great family room and deck. Cooked full dinners, the oven and stove were great. Every beach we visited was beautiful. The zephyr cove stables provided a scenic horse ride for all of us-thanks John for the recommendation. Even the pool was fun and relaxing. We would come back again! We had a wonderful summer time experience! This was our first time visiting Lake Tahoe and we were very happy with the opportunity to relax at John and Astrid's condo! We enjoyed the location for access to the local beaches, restaurants and grocery store. The beds were comfortable, the great room was spacious, Wi-Fi service was excellent, and the kitchen was well supplied with cooking utensils, pots and pans, etc. We enjoyed access to local recreational opportunities with the recreation punch card too. If you're driving to the location in the summer, I would recommend brining your own cooler and towels for trips to the beaches. We would return! We had a nice time in the condo. It was a good size for a few couples. The kitchen, while a little tight on space, was well-equipped. Nice BBQ and patio area, which was a big plus. Fairly well-appointed overall. Aside from a few minor hiccups not worth of any detail, it was a nice stay and we would stay here again. We enjoyed having Justin and his friends at our home. Everything worked out fine from our perspective and we were glad they enjoyed their stay. All lake activities (boating, swimming, water skiing, fishing, etc.) and all mountain activities (skiing, cross-country skiing, hiking, mountain climbing, mountain biking, camping, etc.) plus large indoor recreation facility with indoor Olympic swimming pool, basketball, and workout facilities. Great beaches nearly. Art and music festivals in the summer. Bike and ski equipment rentals nearly. Bowling, cinema, etc. Incline has it all, including two golf courses and its own ski area (Diamond Peak). Other major ski areas nearly are Squaw Valley, Alpine Meadows, Northstar and Heavenly Valley. Ski: Skiing very close (5 minutes, bus access) at Diamond Peak. Also nearby (within 1/ hour) are world-class Squaw Valley (home of the 1960 Winter Olympics) and Alpine Meadows, and Northstar (in one directions) and Heavenly Valley (in the other direction). Other smaller areas are also close by. Diamond Peak is particularly good for family skiing and ski instruction for children. Payment includes refundable $200 damage and key deposit, which is returned following receipt of the keys (and recreation card for rentals of a week or more) and providing there is no damage.